In a move far surpassing the now-common infinity pool trend, residential developers Ballymore Group have revealed plans to install a transparent swimming pool between two blocks of their £15bn (approx. $23.5 billion) Embassy Gardens project in southwest London. The crunch? 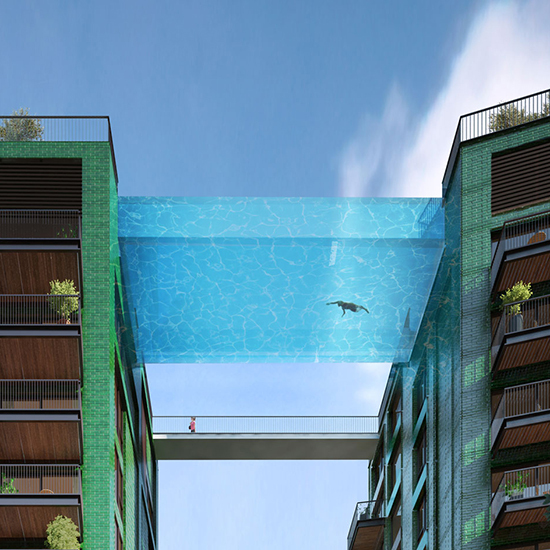 The pool – seemingly designed by Arup Associates with the singular intention of antagonising sufferers of vertigo – is suspended 35 metres above the ground. 'The experience of the pool will be truly unique,' explains Ballymore Group chairman and CEO, Sean Mulryan. 'It will feel like floating through the air in central London.' And who, for a starting price of £602,000 (approx. $945k), wouldn't want that?